Another thing I noticed early on was the flair that the homeplate umpire was exhibiting. His calls were flamboyant and spirited. The highlight of his performance was the calls he would make when a batter would strike out looking. He would drop his arms to his sides, walk about 5-6 steps to his right and then punch out the hitter emphatically. Early and I thought he was about to walk into the stands and punch us in the face. We loved it. If only MLB umpires displayed the artistic panache this Cuban umpire did then the game would be so much more entertaining. Update: Sadly, footage of Omar Lucero no longer exists. Although it is highly unlikely that Lucero would ever defect, the World Baseball Classic would do well to include him in an umpiring crew. Could you imagine him ringing up Derek Jeter in this fashion? How would the MLB players react? Bah can’t see the vids at work will need to wait until this evening to check him out. They’d go running to the players union and the commissioners office. Very true. I would love to see Eric Hinske turn around to argue a called strike 3 to see that there is nobody home since the umpire is halfway down the first base line punching him out. Magic! Fanfuggintastic. I love me an enthusiastic umpire. 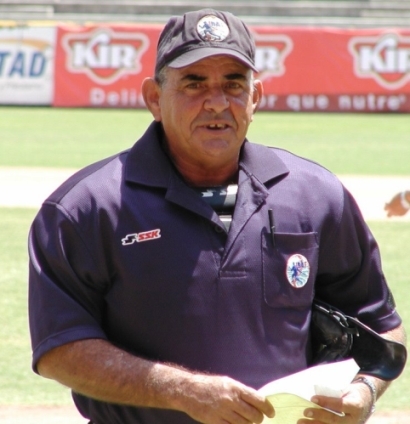 Lucero is the home plate umpire tonight for game 6 in the Cuban Championship Serie. Wild. I can only imagine the atmosphere at Estadio Augusto César Sandino when Lucero punches out Malleta or Chirino. Electric! In that punch out scene, that CAV pitcher has a very irregular pitching wind-up. He starts in what looks like a full and then slides into a stretch with noone on base. That would be a balk with runners on. Very unorthodox.